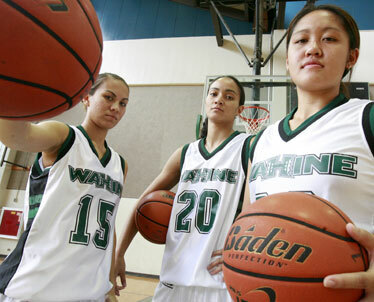 Leilani Galdones, Saundra Cariaga and Keisha Kanekoa all came to UH from the Big Island. The growth of Big Island basketball will be particularly evident today when Hawaii's starting five is introduced. Three Rainbow Wahine starters hail from the Big Island, a result of the development of high school and youth programs and, perhaps, the laid-back lifestyle of the island itself. "There's nothing to do over there besides play sports and go to the beach," Hawaii freshman and Honokaa graduate Keisha Kanekoa said. Kanekoa, the Star-Bulletin All-State Player of the Year last spring, will be given the keys to UH's three-guard attack in her first collegiate game when the Wahine open the season against Washington in the first round of the Waikiki Beach Marriott Classic. Redshirt freshman Leilani Galdones (Kamehameha-Hawaii '06) and senior Saundra Cariaga (Kealakehe '04) will also start in the backcourt. "We played with the same coaches, played on the same teams, played against each other, went to camps together," Cariaga said. "I like having them here, it's like a little piece of home." They'll be joined by two international players, forward Dita Liepkalne (Latvia) and center Tanya Smith (Australia), in the starting five for the game (5 p.m. tip-off) at the Stan Sheriff Center. The Big Island trio enjoy playing the up-tempo style coach Jim Bolla preaches, with Kanekoa as the playmaker, Galdones the perimeter shooter and Cariaga the slasher. "I like to play that pace, I like to run the floor and (Kanekoa's) really good at seeing the open court," Cariaga said. "It'll be exciting this year." Today's game will be Galdones' first since KS-Hawaii lost to Kalani in the 2006 Division II state championship game. She had knee surgery that summer and redshirted her first year in the UH program. "In a way it was good, because I got to see how hard they work and what they expect," Galdones said. "It was a learning year for me." Cariaga is the only member of the trio with college experience, starting 17 games last season and averaging 5.1 points and 2.6 rebounds, and Bolla forsees the skills of the other two guards enhancing her game. "With these two players, it lets her play the way she's capable of playing," Bolla said. "In the past we haven't had the guard play that was compatible with Saundra's style. They've kind of got this sense about each other. They play a similar style, so when we come down the floor they kind of know where the other one is." That connection could be traced to former Honokaa and current Hawaii-Hilo coach Daphne Honma, who mentored all three at various points in their development. In fact, it was Honma who convinced Cariaga, then a soccer player, to give basketball a try. Although a bit ahead of the other two in age, Cariaga could see the potential in Galdones and Kanekoa as they made their impact on the prep basketball scene on the Big Island. A year after Konawaena won its first state crown, Galdones led KS-Hawaii to the 2005 Division II state championship and a runner-up finish the following year. Kanekoa's Honokaa team placed third in the last three Division I tournaments. She closed a prolific prep career by scoring 32 points against Punahou and 26 against Iolani. "Being from the Big Island you always knew who these guys were and what they were about," Cariaga said. "And I always like to watch the up-and-coming players from the Big Island." The ESPN2 broadcast of the UH football game against Nevada will be shown on the video screens in the Sheriff Center during breaks in the women's game and the men's game against Illinois set for 8:05 p.m. The men's game has been designated as a "white out." The arena will be cleared between games, but reopened to allow ticket holders for the men's game to watch the football game.